What do you do when you’re in a square world but you’re not a square? Through creativity and imagination, three friends work together to make the world welcoming for everyone, a place where everyone can enjoy daily life without any limits. With lots of fun and a little bit of chaos, this uplifting story is full of friendship, difference, and discovery. This is a non-verbal story, set to an original commissioned soundtrack, which uses clean-cut simple design, object manipulation and elements of surprise to create an ever evolving and imaginative world. A place where we discover anything can happen once we think differently and rip up the rule book. 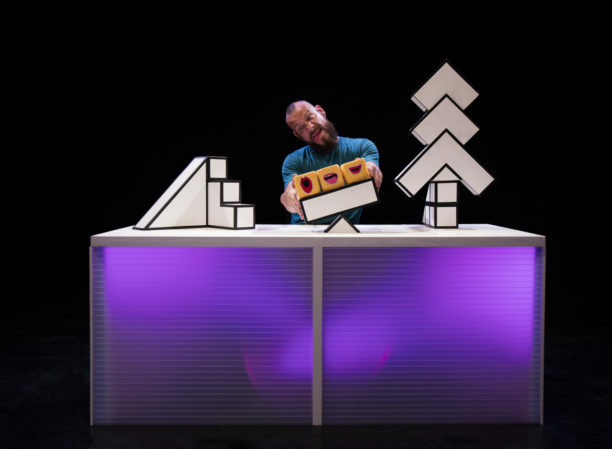 There will also be a relaxed performance of a Square World at 11am as part of our Z-access Family Fun Day.